On Tuesday May 29th bill C 311 was posed to pass it’s third reading in Canada’s Parliament. Introduced as a private members bill by Dan Albas, this bill supposedly had support from all the parties and was sure to pass. The wine industry and Canadian consumers were holding their breath and getting ready to pull some corks and celebrate. Finally after eighty years, shipping wines between provinces was going to be legal. Free My Grapes was going to happen. Our Nell was going to become an honest woman ! Lets tell this story through media articles and what happened on social media. To start let us look at an article from lawyer Mark Hicken http://www.winelaw.ca/cms/index.php/news/1/206-canadian-wine-shipping-law-reform-coming-closer. There was also an article in the Penticton Western News titled “Politicians rally around wine bill”, with pictures and everything of everyone standing around drinking wine and smiling, it is all going to be good, right. It is always going to be good when the pols are drinking wine. At least they where drinking B.C. wine .http://www.pentictonwesternnews.com/news/154260875.html. Expectations were high. Even I felt the glow. It was all going to have a happy ending. No corks pulled, no celebrations. It had all gone sideways. No B.C. wine for you Ontario. I will still have to smuggle wine back and forth across the country. The bill had stalled. The earliest possible time to pass would be in the fall, or perhaps never . Our poor Nell was tied to the railroad tracks with the train speeding ever closer. The Villains dressed in black sitting on the side lines, laughing maniacally. Our hero was similarly trussed up and could not save our poor Nell. So what happened ? 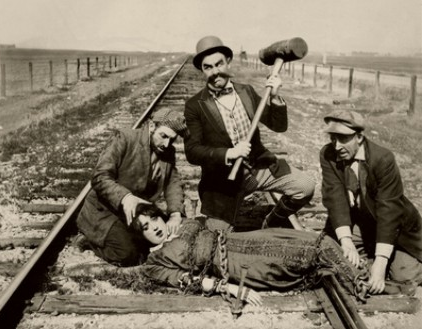 How did our poor Nell get tied to the tracks ? At best, was she going to have to go back working in the Saloon serving Cellared in Canada wines? Here is a great article from BC Wine Lover on how it all went wrong. http://bcwinelover.com/2012/05/bill-c-311-stalled-by-political-filibuster/?utm_source=feedburner&utm_medium=email&utm_campaign=Feed%3A+bcwinelover+%28BC+Wine+Lover%29. Stalled by a political filibuster. Instant anger and a sense of how could they do that to our Nell. Then all hell broke loose on social media. Facebook and Twitter went nuts. There is a weekly forum on twitter with the hashtag #bcwinechat. BC Wine chat is hosted by Sandra Oldfield from Tinhorn Creek every Wednesday night on Twitter at 8:00PM PST. Here is link to the conversation http://www.coveritlive.com/index.php?option=com_altcaster&task=siteviewaltcast&altcast_code=9b0d3d04a5&height=550&width=470 . Here are some of the stats, all in a forty eight hour period. There were 1500+ tweets with 2.5 million impressions, 358 contributors in that hour alone during #BCwinechat. Meanwhile the #freemygrapes hashtag on twitter had 1031 tweets with 345 contributors with 1.5 million impressions. There were also over 250 (I stopped counting) tweets directed at Thomas Mulcair to get his party on board to let the bill pass. I do not need to comment on the numbers, but the audience was booing the villains from their seats. Meanwhile the press, in another scene, were commenting on the Villains’ behavior. An article from the National Post http://fullcomment.nationalpost.com/2012/05/30/john-ivison-popular-wine-bill-stalled-by-ndps-cynical-games/ The national media was commenting on the cynical games, and why our poor Nell was tied to the tracks and about to be run over. Wait, fade to black, another scene at the zoo, I am sorry it was on Parliament Hill, wrong movie. The villains say they did not mean it and offered to untie our poor Nell. It was all a mistake, a misunderstanding.http://www.cbc.ca/news/canada/sudbury/story/2012/05/30/pol-wine-between-provinces.html. Here are some some more comments on the story of our poor bill. This entry was posted in Bill C 311, Canadian Wine law, Tin Horn Creek Wines, VQA and tagged Canadian wine, Dan Albas, National Post, Nell, Thomas Mulcair, Twitter. Bookmark the permalink.